Last week the Delaware Art Museum announced that it will be forced to sell off up to 30 million dollars of its Golden Age Illustration and Pre-Raphaelite collection to help repay its crushing construction debts. 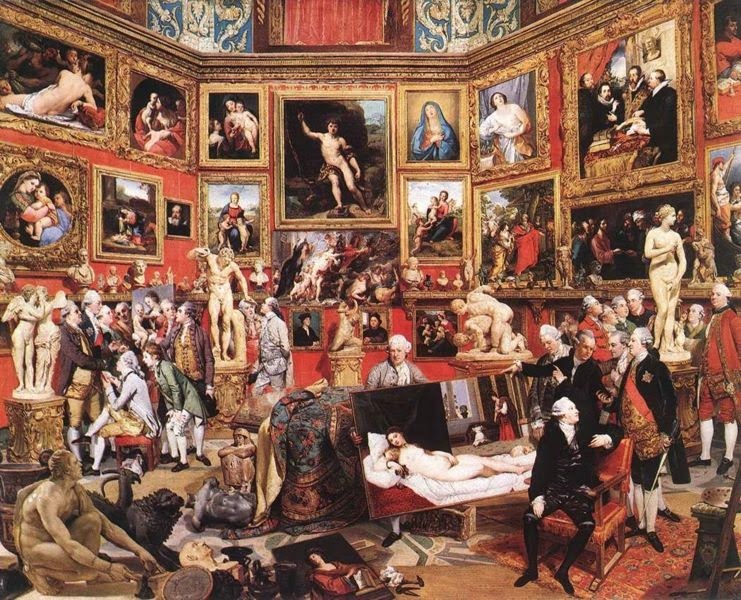 In another sign of a tightening economy, the Uffizi Gallery in Florence has announced that in June, Sothebys will auction its entire collection of pre-20th century works in order to escape mounting insurance and conservation costs. "We will be sorry to see the artwork leave us, but it will all find good homes," said museum director Carlo Bugiardo, "It is vitally important for us to re-imagine the museum for the 21st century." The exhibition space— designed by Giorgio Vasari in 1560— will complete its architectural modernization by 2017 in a project called "Nuovi Uffizi." The overhaul will require the removal of all ornament, marble, and other "dead weight of the past." Sr. Bugiardo plans to open the new space with an installation of two miles of red muslin cloth by artist Giuseppe Finto. James, I apologize. I'm pulling your leg because it's April Fools Day. The Uffizi is intact, hooray. But the Delaware Museum story is true. And the name "Bugiardo" means Big Fibber. Those are indeed unfortunate situations. But, they pale in comparison to to the just announced decision of the Library of Congress to sell the original Declaration of Independence to none other than Vladimar Putin in exchange for Crimea! It looks like the Delaware really is selling off part of it's collection. Too bad! Here in my hometown of Mesa AZ, our library has had a very respectable collection of books on art. For the past 3 years they have been selling off any book that has not been checked out in the last 5 years. The collection has been decimated. They say it is because no one checks out books anymore and they need to make room for more electronic devices. Something here about a birthright and a mess of pottage. James, you really got me with this one! All I could think was, "Thank God I got to the Uffizi before they destroy it." I especially liked the "two miles of red muslin cloth by artist Giuseppe Finto." Ha! I missid the the Christo reference. Great Fun. Ha ha ha. You had me there. I was just starting to see red at the part about 'two miles of red muslin cloth by artist Giuseppe Finto'. My pulse is returning to normal now. Ha! You nearly got me last year with the incredible dino-dung-lamp souvenirs!! But not this time, Sir! Happy April Fools Day, Jim! I was just asking myself what "re-imageing the museum for the 21st century" would mean, and where the "good homes" would be, with all those auctioned treasures having been sold for billions -: Hidden strongrooms & safes? I thought from now on in 2014, after so many experiences, I'd be immune to 1st April foolings. Perfect! I got me until I read the other comments. It's so in keeping with the modern way of thinking that it honestly didn't surprise me. I'd like to suggest the Delaware Museum could probably sell off some of there modern junk but of course then they would alienate the very people that underwrite their shows. Your post has a ring of truth that made it very believable. OMG!! You really got me on that one! The Uffizi is the number one spot on my bucket list and I am going in Sept. I was in a total panic until I started reading the other comments! And, of course, you really had me going as well, however, Uffizi - Delaware Art Museum - Mesa, AZ Library....either way, it's tragic in any or all of these circumstances....I just wish the American people would understand that we are in the midst of a very real economic recession...an economy that will likely never see the prosperity many of us are accustom. Equally troubling is the collapse of the American gallery. American people (at least the upper middle classes) are not buying the work they once did. The billionaires are not affected....we are....the middle classes. And to not be able to check out a book or see a masterpiece without having a friend named Guggenheim or Rockefeller with a fabulous living room....well, just tragic. We need to change a few things, it appears to me. April Fools!! Ouch you got me, and good! Breathe, breathe . . . deep breaths. (long exhale) Ommmmm . . . ok, I think my heart is back to normal now! After I got sucked in hook, line and sinker with the Discover magazine's hotheaded naked ice borers (google it! :D) several years ago I didn't think I would fall for this type of thing again . . . but, you got me with this! I was so sad I had not been to the Uffizi before the desecration was to take place. As d-vallejo mentioned, it does seem to be the way people think these days as witness to Delaware Museum and Mesa's decisions . . .
We once had a high school principal, looking for more library space, suggest ridding the library of all books published before 1976. That lasted until someone reminded him it was a religious school and the Bible would have to go! From Rubens to Raphael; all of these paintings, (horribly crammed onto a single wall; and each and everyone of them certainly deserving a wide room of its own): All of them stunningly painted down here. And on top of it, also those priceless sculptures have been rendered so faithfully . Great picture! I keep on admiring. Ha! I was reading through several of your posts in my inbox, not paying attention to the date of the post. I buying all until I saw they were getting rid of ALL pre-20th century art and installing 2, read TWO, miles of cloth. And then I looked at the date of the post. LOL. Also, sorry to hear that the Delaware museum part of the story is the sad truth. This was a clever one. It's a good think I looked at the date or my blood pressure would have risen to dangerous levels. Sorry to read about the Delaware Museum; these are difficult economic times for all but the 1%. I would rather they sell a couple of pieces than not be able to sell anything and go under. imitate intended for residential use.